Through the use of filters the user can access all Nucleonica applications and tools (show all) or a subset of these application and tools based on the most recently used (last used), most popular (popular), type (applications, data, knowledge), etc. Icons are colour coded according to the categories: nuclear science application (blue), data visualisation (green) and knowledge (violet). The last used nuclides (brown) have their own catergory (last nuclides). Each icon has the form of a box with header (similar to nuclide boxes in the nuclide chart). In the header part, a short name for the application/tool is given (e.g. DE++). In the central part of the icon, the full name of the application/tool is given (e.g. Decay Engine++). There is a "Classic" icon which allows users to access the previous version of the App Portal i.e. Nucleonica Classic applications page. This will be supported for a limited period to allow users to become familiar with the new App Portal page. 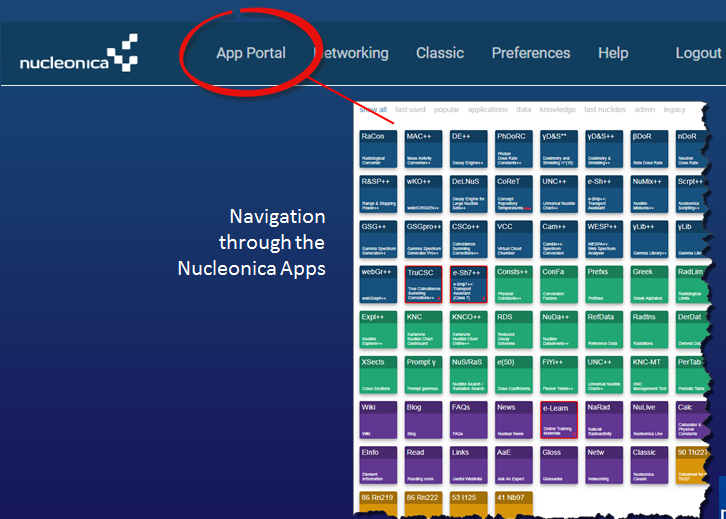 The App Portal provides the main interface for navigation through the Nucleonica applications. The Portal can be reached directly from the page header as shown in the image below. Applications have been divided into three coloured coded categories: Applications (Blue, for calculations); Data (green for data display); and Knowledge (violet e.g. wiki, blog). In the original navigation page, you had to make 2 clicks to start a new application; one in the header taskbar to expand the drop down menu, and then one click to select the application. In the new App Portal, there are again only two clicks, one to open the App Portal and one to start the application. the group of links in the old version (i.e. Applications, Data, and Knowledge) have been replaced by the single link to the App Portal. design of the new page header is now much improved. the user has to identify Apps only once. Thereafter used Apps are "remembered" in the "last used" filter category. Most users only use 8-10 apps on a regular basis. So this makes the "last used" filter very convenient for fast selection of one’s main Apps of interest. there are other filter categories which can assist in the navigation e.g. applications, data, and knowledge, last nuclides (admin and legacy for admin users only). 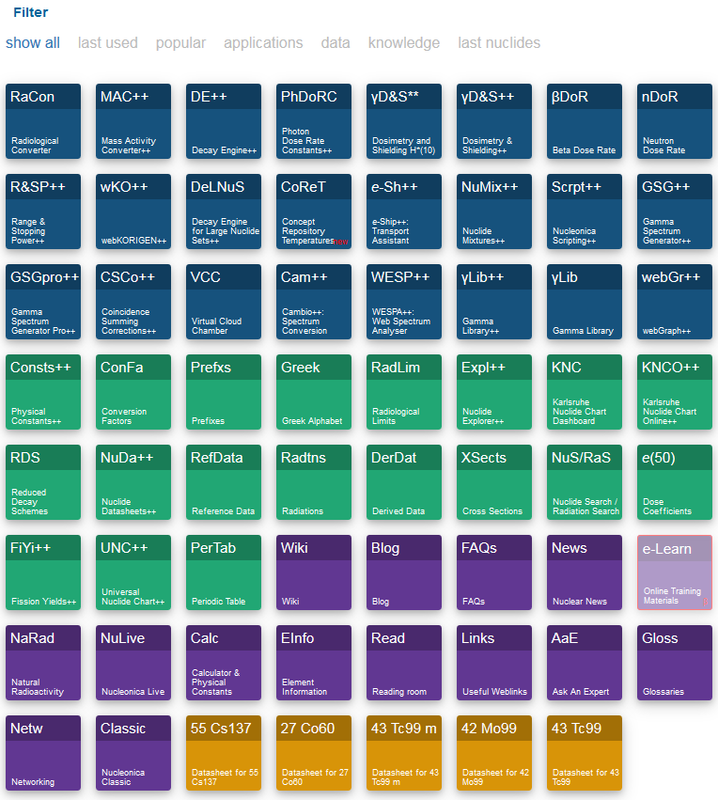 there is also a filter category "popular" which shows the most popular apps for all Nucleonica users. in the last used Apps, tiles are sorted with the most recently used App first, the second most recently used App second, etc. There are currenlty approximately 70 app tiles in the App Portal. Without filters it might take some time to find the app one is looking for (see image). Filters have been introduced in the App Portal to improve navigation. In the image below, the "show all" filter lists all (approx. 70) Apps. If the "last used" filter is selected, the system shows the user's most recently used apps as shown in the image below. There you can see a typical 8 most recently used “last used” apps. It’s then easy to select one of the user's most commonly used apps. This page was last modified on 15 February 2018, at 14:37.